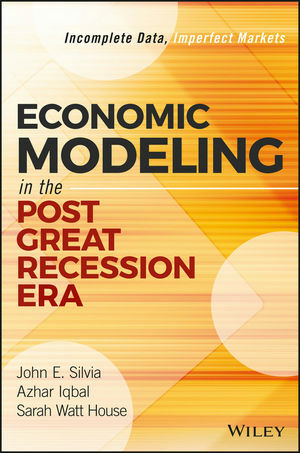 Economic Modeling in the Post Great Recession Era presents a more realistic approach to modeling, using direct statistical applications to address the characteristics and trends central to current market behaviors. This book's unique focus on the reality of today's markets makes it an invaluable resource for students and practitioners seeking a comprehensive guide to more accurate forecasting. While most books treat the economy as if it were in a vacuum, building models around idealized or perception-biased behaviors, this book deals with the economy as it currently stands—in a state of recovery, limited by financial constraints, imperfect information, and lags and disparities in price movements. The authors identify how these characteristics impact various markets' behaviors, and quantify those behaviors using SAS as the primary statistical tool. Today's economy bears a number of unique attributes that usual modeling methods fail to consider. This book describes how to approach modeling based on real-world, observable data in order to make better-informed decisions in today's markets. The past few years have shown a clear demarcation between policymakers' forecasts and actual outcomes. As the dust settles on the Great Recession, after-effects linger—and impact our current recovery in ways that diverge from past experience and theoretical expectations. Economic Modeling in the Post Great Recession Era provides comprehensive guidance grounded in reality for today's economic decision-makers. JOHN E. SILVIA is a managing director and the chief economist for Wells Fargo. Previously he worked on Capitol Hill as senior economist for the U.S. Senate Joint Economic Committee and chief economist for the U.S. Senate Banking, Housing, and Urban Affairs Committee. AZHAR IQBAL is director and econometrician at Wells Fargo Securities. SARAH WATT HOUSE is vice president of Wells Fargo Securities.